Fotospeed has unveiled a new Tubless Inkflow system for the Epson R3000 printer, using the same concept as the Inkflows for the Pro 3800 and 3880 using refillable cartridges. The new system means that no additional tubing or tube damps are needed to stop the ingess of air. Cartridges can be refilled using the supplied filling kit, with the cartridges plugging straight into the printer ready for printing. When a cartridge runs out all you need to do is remove the cartridge, refill and reset the chip to return it to the printer. Fotospeed claims that the system can save up to 85% on the cost of ink, when compared with OEM. 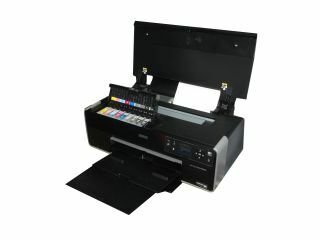 When purchased, the system also comes with the equivalent of £1080 worth of Epson ink (based on 45 x 25ml cartridges) and a sample paper pack worth £40. Within the kit, you will find 9x Fotospeed Inkflow carts, 9x 125mls Fotospeed 4K Pigment ink, 1 x Ink transfer kit (9 syringes, 9 adaptors), 1 x 30 sheet Fotospeed A3 trial pack and a comprehensive instruction manual. The Fotospeed Tubeless Inkflow for R3000 UK price is £249.99 and is available now. The Epson R3000 was released earlier this year as an upgrade to the R2880 and featured cartridges which contain 2.27x more ink. The standard price of ink for the R3000 is £24.35 per cartridge, or £219.15 for a full set.